When Paul Duran started GreenStar in a small warehouse in Boerne in 2009, he was trying to solve the heating problem created by traditional incandescent lights in the electric refrigerated truck bodies he was manufacturing. LED lights, he knew, created as much illumination as traditional bulbs, with the ability to dissipate the heat — all while using a third of the power. Just five short years after the company began, GreenStar is now a wholly owned subsidiary of Toshiba Lighting and Technologies, with its Americas headquarters in San Antonio and selling to municipalities and commercial businesses worldwide — and it’s just recently installed its 50,000th LED light. Of those, more than 14,000 are now illuminating many of San Antonio’s main thoroughfares, as part of a deal between CPS Energy, GreenStar and the city of San Antonio. The company was one of CPS Energy’s first New Energy Economy partners. 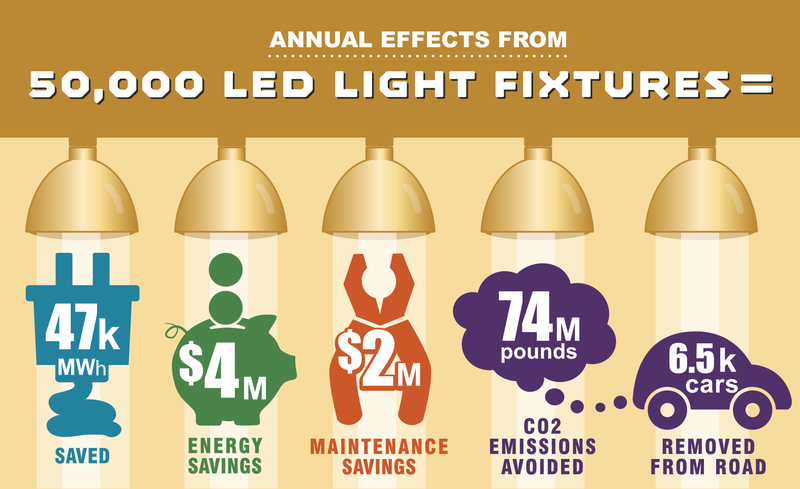 When the upgrade is complete this summer, 25,000 LED streetlights will offer San Antonio drivers brighter, more natural looking and more direct, not to mention longer-lasting illumination of city streets — and use 60 to 70 percent less energy to do so. Together, the 50,000 lights installed worldwide thus far by GreenStar have saved 10 MW of power, according to the company. Annually, that’s 47,000 megawatt hours of power not needed. And since the cleanest energy is that which isn’t used, not generating that 10 MW has avoided spewing 74 million pounds of CO2 emissions per year into the air — the equivalent of getting more than 6,500 cars off the road. The customers who’ve installed those lights are enjoying the financial benefits, too. GreenStar estimates that together they’ve saved $4 million in energy costs, plus another $2 million in avoided maintenance costs, since GreenStar’s LED lights can last for more than a decade. And they’re being manufactured right here in San Antonio, employing more than 40 people — almost double the company’s workforce from just a year ago. A giant “We’re Hiring” banner hangs over the entrance to the modular manufacturing site on the city’s far West Side. 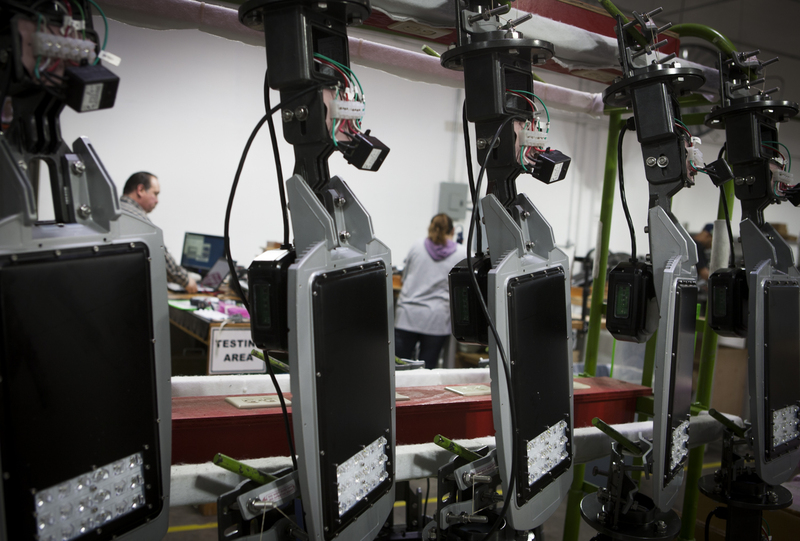 Employees at GreenStar’s assembly plant test new LED street lights. “We’re hiring for assembly, warehouse and quality assurance roles on two shifts,” said Tom Wright, vice-president of operations. He said the company manufacturing strategy allows it to quickly and easily increase its production capacity based on customer needs. Research and development is now headquartered in New Delhi, and employs another 40 or so there. And while components and parts come from all over the world, GreenStar sources locally whenever it can, said Wright. The company has made giving back part of its ethos; as part of its deal with CPS Energy, GreenStar agreed to contribute $10 to the University of Texas’ College of Engineering for every light fixture the firm sold to the city. “This green economy is a new business and we need to teach our kids what it is all about,” Paul Duran told the UTSA publication Giving in the summer of 2012, noting that none of the 14 engineers on his staff at the time were from San Antonio. The money was used to endow the GreenStar Energy Engineering Professorship in the College of Engineering — the college’s first energy-related endowed professorship.